Concluding our Ruin/s theme, we are delighted to welcome everyone to our final event for a screening of Nikolaus Geyrhalter’s 2016 essayistic documentary, Homo Sapiens (2016), followed by an illustrated response from Prof. Carl Lavery (Glasgow) and in conversation with Prof. Anna Reading (King’s College, University of London). Previously Prof. Lavery contributed to the Ruin/s debate, with his Thinking Like a Ruin lecture in 2015. He now returns to help us conclude that dialogue on ruin/s, and still and moving images. Combining film extracts with images, and counterpointing these with his own film on Hashima Island, he aims to create an essayistic dialogue with Homo Sapiens. Offering her own response, based on her contribution, Save As … Planet Earth, to the Ruin/s debate, Prof. Reading will conclude with an in-conversation with Prof. Lavery. This event is free, but it is essential to reserve. Click here to secure your place. Presented as partnership between BIRMAC and the Essay Film Festival, Homo Sapiens is an essayistic documentary made by the Austrian filmmaker, Nikolaus Geyrhalter, and chronicles, as a wordless collection of long, static shots, a series of sites in a state of ruination following natural disaster or human abandonment. This screening, including presentations and discussion, is the culmination of a three-year critical exploration of the theme of Ruin/s, where BIRMAC has sought to question the rigid distinctions between nature and culture, aesthetics and politics, memory and history. Even though Homo Sapiens doesn’t locate its sites geographically or politically, there are numerous clues, as it evokes various disasters (New Orleans, Fukushima, Tchernobyl), as well as iconographies of the ruin, both dystopian and utopian. The documentary offers a compelling modern meditation on man versus nature, and its succession of images shot by Geyrhalter across the world opens up questions about the distinction between natural and man-made catastrophes. HOMO SAPIENS is conspicuous by its absence – there are no human beings visible – or rather by the stunningly fragile, impermanent and weirdly irrelevant constructs which, without their human use, look like mysterious, surreal sculptures or giant machinery left here by aliens. 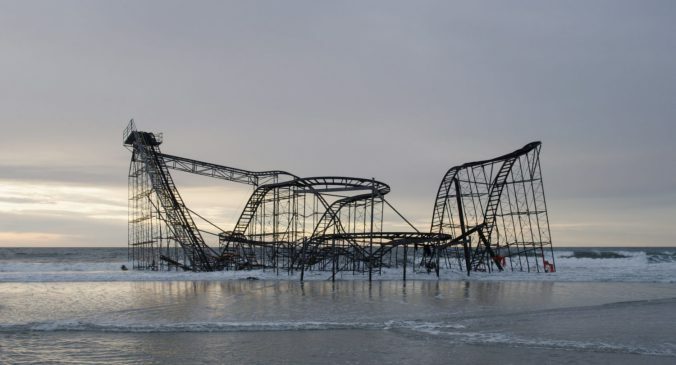 Each image is a Stonehenge of strangeness, especially Geyrhalter’s showstopper: the rollercoaster which is now partly immersed in the sea. There is also an incredible interior, apparently a cave, filled with wrecked cars.